Nail trimming should be a quick, simple procedure. Unfortunately, this basic grooming task often turns into a stressful experience for people and pets alike. Whether you're concerned about hurting your pet or aren't sure which tools to use, these tips may help make nail trimming much more pleasant for both you and your pet. Your pet may not require candles and soft music for nail trimming, but picking the right time and place is important. Choose a quiet room away from the action and choose a time when things are relatively peaceful at your house. Your pet is much more likely to react positively to nail trimming if you're relaxed and patient. If you'll be cutting your pet's nails for the first time, it's a good idea to begin the process slowly. Begin by simply holding your pet's paw in your hand for the first week or two. If you have a cat, use gentle pressure to expose the nail. Offer your pet a treat at the end of these sessions. The sound of the clippers can be disconcerting to some pets. 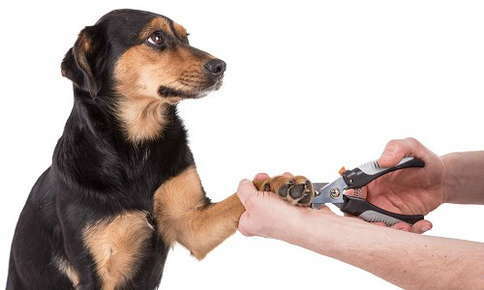 While you hold your pet's paw with one hand, use the other hand to open and close the clippers a few times. Once your pet becomes accustomed to this step, you can move on to the actual trimming. Hold clippers at a 45-degree angle when cutting your pet's nails. Cut quickly and decisively. If you're too tentative, you may not cut the nail completely, which means that you'll have to start the process over again. The choice to use guillotine or scissors is a personal preference. You may want to try both kinds of trimmers to determine which are easier to operate. Look for trimmers that cut easily and quickly, aren't too bulky or heavy, and don't shred the nails. Clippers can become dull over time. Be sure to sharpen or replace them regularly. If your pet's nails feel a little rough after trimming, file them lightly to prevent snags on carpets and fabrics. Cutting through the quick, the vertical pink line in the center of your pet's nails, will cause pain and bleeding. Always start your cut below the quick to avoid injuring your cat or dog. If you don't think the nail is short enough, make another small cut, as long as you can do so without coming too close to the quick. The quick may appear black or gray instead of pink in pets with dark nails. If you're not sure if you should continue cutting the nail, look for a small gray or white circle inside the nail. If you see the circle, you're getting too close to the quick and shouldn't attempt another cut. Styptic powder or cornstarch will slow bleeding if you accidentally cut through the quick. Although cutting all of your pet's nails in one session might be your goal, that's not always realistic. Your pet may be perfectly willing to sit still while you trim one or two paws but not all four of them. The more your pet squirms, the greater the chance that you'll cut the quick or a paw. If your pet objects to trimming, put down the clippers and try again in a day or two. Sometimes, it's easier to trim your pet's nails if you have an assistant. Your helper can distract your dog or cat or hold your pet while you concentrate on the trimming. If help isn't available, hold your cat on your lap facing outward, gently press on the base of the nail to extend it, then use the other hand to operate the clippers. No matter how patiently you approach nail trimming, it may still be a struggle in some cases. If you don't feel comfortable cutting your pet's nails, give your veterinarian or groomer a call. These professionals can convince the most reluctant pets to cooperate and are happy to handle nail trimming for you. Do you need a little help trimming your pet's nails? Contact us to schedule a quick, convenient appointment.